The last time we saw a Darren Aronofsky film, he gave us the inventive, if a bit miscast, Noah (a movie I'd probably like to see again if given the chance). Since then, the director has kept a lower profile, most recently surfacing to produce Pablo Larain's Jackie. But, with mother!, he returns to his own take on the Argeno/Polanski-esque horror trappings that brought us Black Swan - and based on the teaser below - it may be an ever more overt play into the genre than that 2010 masterpiece. The movie has been kept TIGHTLY under wraps, but the first full trailer drops in a week. 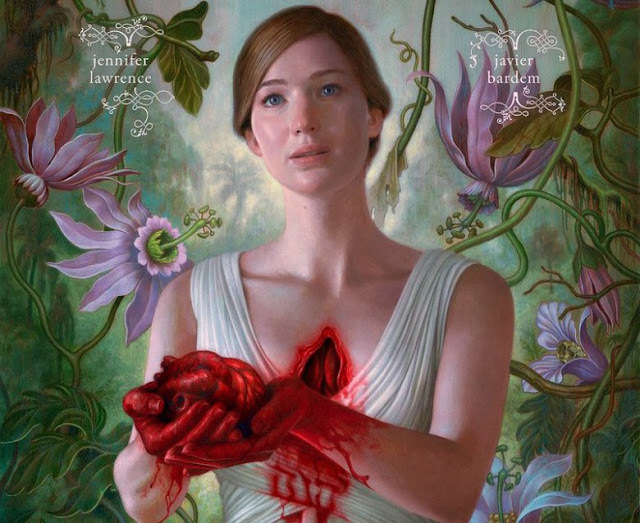 It stars Jennifer Lawrence, Javier Bardem, and Michelle Pfeiffer, and centers on a couple whose existence is wracked by uninvited visitors into their home. Update - Here's the full trailer!! This is THE September movie to keep an eye out for.